Konami has announced that it will be releasing a series classic game collections to PC and consoles to mark 50 years since the company was founded. Recent media information on Twitter has invited players to “dive back into the action” in a mix of games, starting with the arcade classics where Konami first found success. 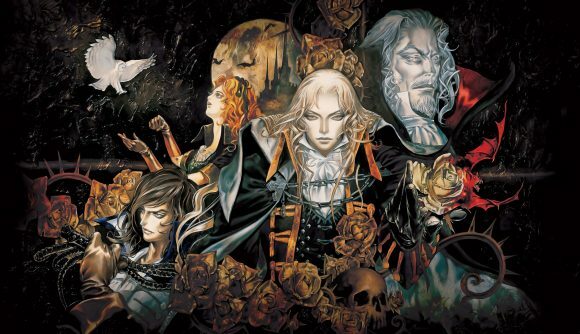 Most notable is the Castlevania Anniversary Collection, which is set to release in early summer. The collection will include the first four Castlevania games, including Super Castlevania IV which was originally released for the SNES. Screenshots show that a further four games are yet to be announced for the line up, though they are likely to be from the earliest iterations of the game. Some speculation suggests that the collection will be the first in a Castlevania collection series. Konami’s press release states that “the first Konami Castlevania collection is designed to be a completed collection around the origins of the historic franchise”, which suggests the first collection will focus solely on the very first Castlevania games. Fans of later games in the series may well have to wait for later collections before they can storm the castle in modern 3D. Fans of the run and gun shoot-em-up Contra have also been treated to a digital collection, that will also include the first four games in its series. Much like Castlevania, the next four games included are likely to be more classic titles from the series from the late 90s – which might disappoint fans of Contra’s PS2 outings. First to release is the Arcade Classics collection, which hits stores April 18 2019, and includes “eight arcade masterpieces” that have been updated with modern features. The games, which include Haunted Castle, Typhoon, and Nemesis come with the promise of “retro glory”, and the collection includes an eBook that allows game history enthusiasts a deeper insight into the classic titles’ development. Personally, I can’t wait to get my retro on in the first release in less than a month’s time. For some of us, it’ll be our first chance to play older Konami titles that have long since disappeared from arcades.